Although Mythologies, published 15 years ago in France, may seem a lamentably late arrival on these shores, it is still the gamiest of structuralist studies. In these short, spirited essays, Roland Barthes investigates what he calls "petit-bourgeois culture" (what we call "Pop"). However, beneath the raffish subject matter -- "The Face of Garbo," "The Brain of Einstein," "Operation Margarine" -- a systematic "unmasking" takes place. Toys, for example, are really a microcosm of the adult world: "they are all reduced copies of human objects, as if in the eyes of the public the child was, all told, nothing but a smaller man, a homunculus to whom must be supplied objects of his own size." For Barthes, "wrestlers remain gods because they are, for a few moments, the key which opens Nature, the pure gesture which separates Good from Evil, and unveils the form of a Justice which is at last intelligible." These statements, perhaps, taken out of context, sound portentous or absurd. But Barthes is a wily observer of "naturalness" and the "falsely obvious." A vivid polemicist (Marx, Freud, and Sartre are part of his well-equipped arsenal), Barthes has something too of the classic artistry of Montaigne. Indeed, unlike most structuralists he is a pleasure to read. Of course, in methodology he owes an immense debt to Ferdinand de Saussures, the great Swiss linguist who died in 1912, but Saussures could never have imagined the sinuousness of Barthes' style or the zest of his insights. "Garbo offered to one's gaze a sort of Platonic Idea of the human creature, which explains why her face is almost sexually undefined, without however leaving one in doubt." Surely that is the best comment made on la Divine. 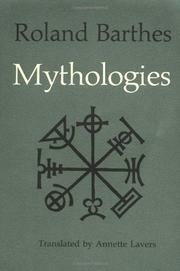 This English edition of Mythologies excludes "Billy Graham Comes to Paris" and one or two other pieces. The selections, however, are ample, and the translation fine.